The State Ministry of Industry and Information Technology recently released the 2014 annual (28th) China Electronic Information hundred enterprise directory, our company was selected. 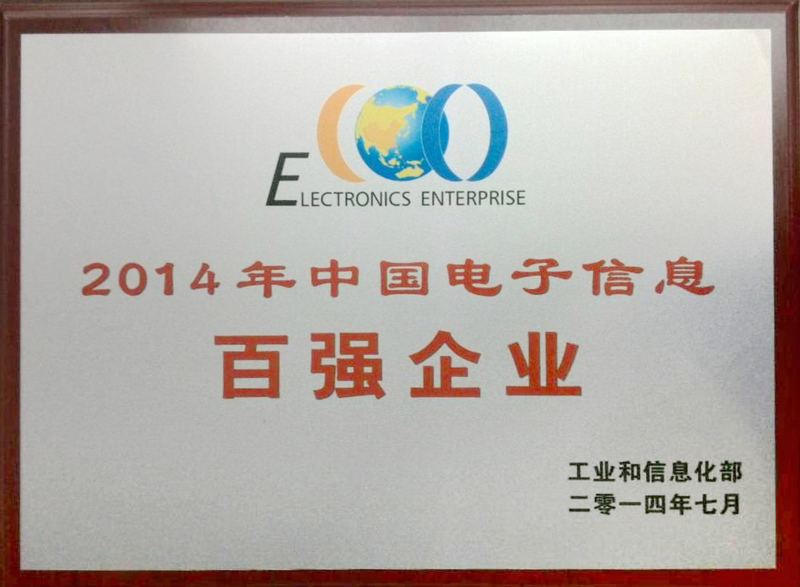 Since 2010, our company has won this title as China's electronic information hundred companies list in five years continuously. According to information, the final top 100 enterprises is maintained according to the 2013 National Electronic Information Industry Statistical Yearbook data approved by the National Bureau , based on enterprise size, efficiency, research and development and other indicators of social responsibility . Data shows that the new electronic information hundred companies shortlisted threshold is 2.47 billion Yuan, 17.6 percent increased over the previous year, at the same time, the top 100 enterprises showing a sustained current scale , highlighting the leading role , improve profitability , enhance operational capabilities , R & D increased investment , innovation and remarkable achievements and other notable features . Situation changes occur rapidly in technology industry , our company has consistently ranked China Electronic Information top hundred enterprise list in recent years , which shows the Ministry of labor ‘s approval and confirmation for our company in terms of research and development capabilities , economic and other recognized abilities . we take "technology to improve lives " as our mission, keeping up with market demand over the years, developing new products, expanding product range, exploring product performance improvement, innovation and product appearance, relentless pursuit of business philosophy as " quality is the root for survivor and dedication for service", in order to contribute more electronic product which can improve the quality of people’s life.